(17/P65) TRENTON – After an absence of at least a century, American shad have returned to the Musconetcong River in Hunterdon and Warren counties, the Department of Environmental Protection’s Division of Fish and Wildlife and U.S. Fish and Wildlife Service announced today. This milestone in the ecological recovery of the river is the result of the removal of dams on the lower Musconetcong River several years ago, followed by the removal of the Hughesville Dam in Warren County last year. These projects – made possible by a partnership of state, federal, nonprofit and private entities – opened nearly six miles of the Musconetcong to migratory fish, such as shad, that spend much of their lives in the ocean but return to rivers and their tributaries to spawn. As the shad population continues to rebuild, anglers are reminded that this fish may not be taken from any New Jersey freshwater area except the Delaware River. The return of shad to the Musconetcong was confirmed earlier this month after anglers fishing for trout reported seeing small schools of shad in the river above the site of the former Hughesville Dam. Biologists from the DEP’s Bureau of Freshwater Fisheries responded and captured shad at the base of the Warren Glen Dam in Holland Township, Hunterdon County. American shad is the largest member of the herring family, weighing from four to eight pounds at maturity. Shad once supported important commercial and recreational fisheries along the Atlantic coast, especially the Delaware River. But dams built to generate power, for mills and for other now-obsolete purposes greatly reduced their spawning habitat. The DEP is working with partners in developing plans to remove the Warren Glen Dam, largest on the river, as well as others to open even more stretches to migratory fish. The 48-mile-long Musconetcong flows from Lake Hopatcong in the northwestern part of the state and through the wooded and rocky hills of Morris and Warren counties. It flows into the Delaware River at a point in Hunterdon County about 10 miles south of Phillipsburg. Long stretches of the Musconetcong are on the National Park Service National Wild and Scenic Rivers inventory. The DEP classifies much of the river as a Category 1 stream, affording it the state’s highest level of protection due to its exceptional ecological and fisheries values. The DEP and U.S. Fish and Wildlife Service provided funding from Natural Resource Damage settlements for the Musconetcong dam removals. 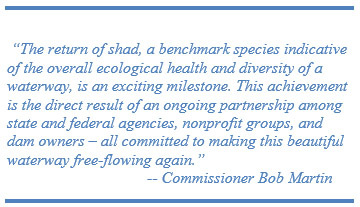 Partners in restoring the Musconetcong to a free-flowing river also include the Musconetcong Watershed Association; American Rivers, the National Park Service, the federal Natural Resource Conservation Service, the U.S. Army Corps of Engineers, North Jersey RC&D, Trout Unlimited, The Nature Conservancy, and International Process Plants and Equipment Corp.